Auckland AFL successfully defended its title as New Zealand's strongest domestic football league over the weekend at the NZAFL National Provincial Championships held at Manurewa. The Aucklanders were too strong against opposition from the Wellington, Canterbury and Waikato leagues, as they went through the tournament undefeated to replicate their 2004 performance. Mt. Roskill Saints' player Steve Fairweather dominated the Auckland forward line, kicking 9 goals in total for the northerners, including an impressing haul of 5 against rivals Wellington. Fairweather was named as Auckland's best player for the two-day Championships. Canterbury forward James Bowden, who starred for New Zealand in their 2005 International Cup triumph, kicked an impressive 12 goals from his three matches. Bowden's efforts saw him named best & fairest player in the NPC and helped Canterbury to a second-place finish overall. Wellington placed third following their 41-point win over Waikato on Saturday. The 'Thunder' team was in no way humiliated though, as they managed to post respectable scores against each of the more-established leagues. This bodes well for the further development of Australian football in the Hamilton area. For the first time in NPC history junior matches were a feature, with Auckland and Wellington Under 16s playing twice over the weekend. On Saturday, Auckland ran out 67-point winners over their southern rivals, though this result was reversed on Sunday when Wellington notched up a 20-point victory. NZAFL General Manager Rob Malone has previously revealed to worldfootynews.com that he plans to include junior teams from Waikato and Canterbury participate in the 2007 NPC, thus expanding New Zealand's junior representative football structure. It is likely that National Team selectors scrutinised each of the NPC matches carefully, as both the senior and junior Falcons teams will compete in prestigious tournaments during 2006. 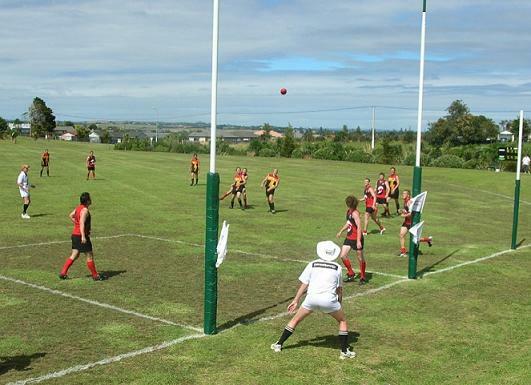 In July, the senior Falcons will participate in the Australian Country Championships on Queensland's Gold Coast. It is the first time an international representative team has been invited to compete in those Championships. The junior Falcons will travel to Canberra during September to compete in the Barassi International Australian Football Youth Tournament. It is likely that the finalised junior squad will include Canterbury players in addition to outstanding Auckland and Wellington NPC participants. Full results from the NPC, including best players and goalkickers, can be found online at the NZAFL website.